Danaid Eggfly (Hypolimnas misippus) complete detail. 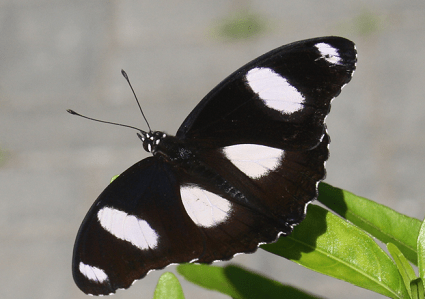 Description of Danaid Eggfly – Hypolimnas misippus. 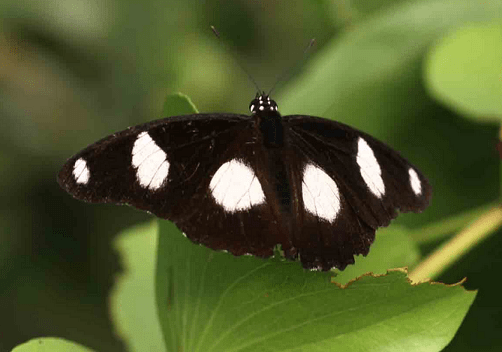 Classification of Danaid Eggfly. Distribution of Danaid Eggfly (Hypolimnas misippus). Habit and habitat of Danaid Eggfly. Danaid Eggflies prefer wetlands, woodlands and open areas. They also found in desert, savannah, acacia scrub, well vegetated beaches, tropical rainforest, and botanical gardens. Males bask on the ground, or perch with wings half-open on bushes, to await passing females. The latter are most commonly seen flitting about on open ground looking for egg-laying sites. Eggs are light or dark green and white in color. The color of Caterpillar is brownish black, and the color of pupa is light brown with grayish appearance. The hind wing male Danaid Eggfly has a larger white spot but the veins crossing it are yellowish and not as prominent as on the forewing. There are some white specks along the tornus and the margin is edged with white and black. 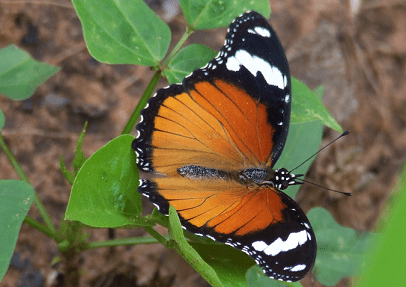 Basal and postdiscal areas of Hind wing is chestnut-red………………..
Danaid Eggfly is a beautiful butterfly, with a wingspan of 55 to 90 mm. The color of antennae, head, thorax and abdomen is dark brown. The adult Danaid Eggflies are dimorphic. The males and females have entirely different colors and patterns. The male however is quite different in appearance, being brownish black on the upper side, with circular white patches that reflect a deep purple sheen in bright sunlight. The undersides of the males are brown with a broad white band across each wing. 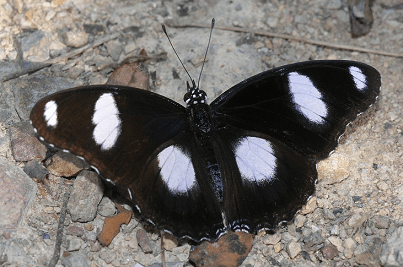 The color of upper wings of male Danaid Eggfly is dark velvety brownish-black. The forewing has a broad white oval spot between the veins 3 and 7. These spots are crossed by the black veins and bordered in iridescent blue that is visible only at certain angles. The hind wing male Danaid Eggfly has a larger white spot but the veins crossing it are yellowish and not as prominent as on the forewing. There are some white specks along the tornus and the margin is edged with white and black. Basal and postdiscal areas of Hind wing is chestnut-red, a black spot at base of vein 8 defined by white lines. They have a postdiscal series of small white spots in continuation of those on the fore wing; an inner sub terminal series of paired sub triangular small white spots, an outer sub terminal line of slender white lunules, an intervening black sinuous line between the two series and a black terminal line. 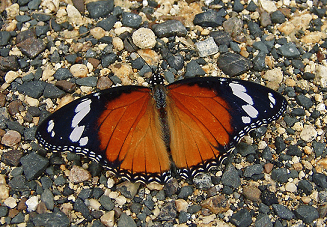 The female butterflies are orange with wide black borders around the wings, and a white patch and a variable number of white spots in the black tips of the forewings. The undersides of the females are very like their upper surfaces. The upper parts of females is rich tawny. The apical half of the fore wing and the termen black, the inner margin of this black area follows a line crossing the cell obliquely and curving round to near apex. A white spot beyond apex of cell, an oblique band of elongate white spots, a more transverse short sub apical series of three or four much smaller white spots, and an inner and an outer sub-terminal transverse series of very small slender white lunules. In the larvae stage, the body is cylindrical, black, with a darker black dorsal line. Head furnished with two long black thick branched spines. Legs and head brick-red. The pupa stage is pendulous. Pupa is short, thick, and light brown in color, without metallic spots. 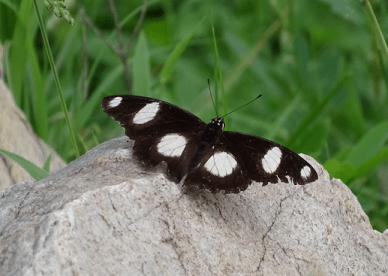 Danaid Eggfly is a very widely distributed butterfly. They found in Africa, south-east Asia, the Pacific Islands, North and South America, Australia, India and West Indies. Danaid Eggflies prefer wetlands, woodlands and open areas. They also found in desert, savannah, acacia scrub, well vegetated beaches, tropical rainforest, and botanical gardens. Males bask on the ground, or perch with wings half-open on bushes, to await passing females. The latter are most commonly seen flitting about on open ground looking for egg-laying sites. They generally found alone or in small groups. Their preferred food plants are Portulaca oleracea and Asystasia lawiana. The adults were found to forage at the floral nectar of Santalum album, Lantana camara, Sapindus emarginatus, Hyptis suaveolens, Antigonon leptopus and Anacardium occidentale. Eggs are light or dark green and white in color. The color of Caterpillar is brownish black, and the color of pupa is light brown with grayish appearance. Female sits over her batch of eggs, protecting them from attack by parasitoid wasps. She remains in position until the eggs hatch, and usually dies in situ. The full grown larva had a light orange coloured head with a pair of black long horns and bearing numerous orange coloured spots, eyes were prominent. Body surface was purplish black, and covered with long glossy black spines. The larva hatched in 2-3 days, and passed through five instars over a period of 13-18 days. The entire life cycle was completed in 23-30 days.